Ontario, CA (October 3, 2018) — Cirque du Soleil is thrilled to return to Ontario, CA with its coolest arena show yet—CRYSTAL. This unique arena production—Cirque du Soleil’s first-ever experience on ice— showcases synchronized, freestyle and extreme skating alongside circus disciplines such as swinging trapeze, aerial straps and hand-to-hand. CRYSTAL will perform at Ontario’s Citizens Business Bank Arena from Wednesday, March 13 through Sunday, March 17 for seven performances only. 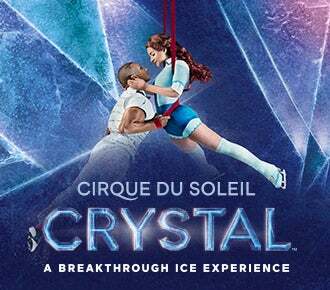 Tickets for CRYSTAL are now available online exclusively to Cirque Club members. Cirque Club membership is free. Benefits includes access to advance tickets, special offers, and exclusive behind-the-scenes information. To join, visit www.cirqueclub.com. General tickets on-sale for Citizens Business Bank Arena’s performances of CRYSTAL will be available starting October 5 at 10 a.m. Tickets are available for purchase online at www.cirqudusoleil.com/crystal, the Arena box office and Ticketmaster.com. Friday, March 15 at 7:30 p.m.
Saturday, March 16 at 4 p.m. and 7:30 p.m.
Sunday, March 17 at 1:30 and 5:00 p.m.